The jumper, any connection to dumpjumper produced for the new movie line? And you're right, the crawler is freaking awesome! Was he meant to be like a vehicle? He would have fit in with those huge mega mutants from the old toy line. That octopus is way wicked ! The jumper, any connection to dumpjumper produced for the new movie line?" "And you're right, the crawler is freaking awesome! Was he meant to be like a vehicle? He would have fit in with those huge mega mutants from the old toy line." I see. Maybe he didn't get the OK because he wouldn't have fit in the normal figure package since he doesn't stand on two legs? It's a shame, he's so much cooler than something like the birthday turtles (even though I love them too). 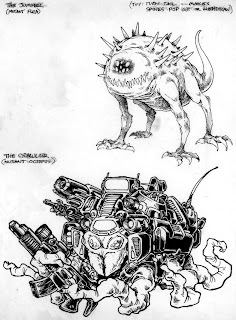 I remember these from the TMNT Role Playing Game book "Turtles In Space" i think. I loved them! By the way, thanks for doing a blog Peter, i appreciate seeing all this cool stuff that is very much a part of my formative years. -->> ..notice some similarities in ways of design style in 'Jumper' there to early J. Lawson designs. ( i recall these in the RPG game materials as well ).